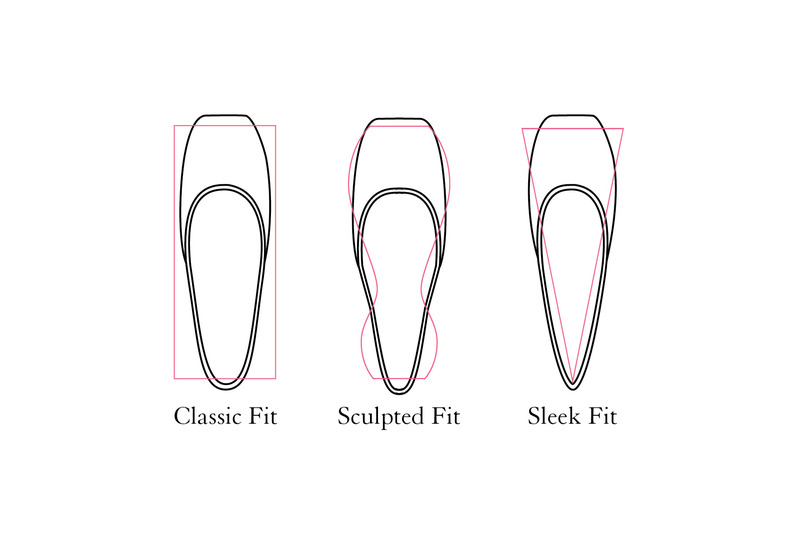 For a pointe shoe to look, feel, and function just right it must be fitted just right. Our ingenious fitting system lets every dancer obtain that professional, customized fit — no special order required. 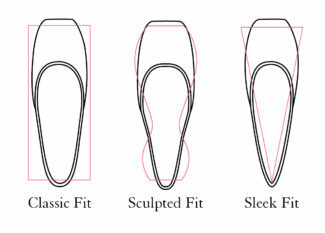 You get to determine the seven crucial specifications that govern fit: model, length, width, box, shank, vamp, and heel. Please take the time to understand your options. Call our Fitters Hotline at 800-637-9240 x12 if you need help! Check the fit of your new shoes carefully. If you wish to return them for refund or exchange they must be in pristine, new condition. Do not attach ribbons or elastics; only pointe shoes that have never been sewn and are spotlessly clean inside and out can be returned or exchanged. Wear ballet tights. Find a place near a mirror where you can see your feet. Stand only on a clean surface; it’s a good idea to stand on a clean cloth. Gently loosen the drawstring so it moves freely inside its casing. Put on your pointe shoes and adjust the drawstrings. Pull them parallel to the floor, not up toward your knees. Tie them in a shoelace knot. Standing flat, your heel should touch the back of the shoe and your big toe should just touch the front. If they don’t the shoes may be too long. If your toes are crunching or curling the shoe may be too short. Demi plié deeply on one leg. Significant pressure on the big toe indicates a length that is too short or a box that is too wide. The addition of a box liner and/or toe cushion can usually eliminate mild pain and pressure if the fit is otherwise correct. If they don’t, you may need a half size longer. Place one foot on pointe. You should be able to pinch 1/8” to ¼” of material at the top of the heel by the drawstring casing. If you can pinch more, you may need a half size shorter. If you cannot pinch any material you may need a half size longer. The box should feel snug and its appearance should be smooth and without creases. Its edge should neither dig into the big toe joint nor end abruptly just below it causing the joint to bulge. If it does you may need a larger box or a wider width. If you change to a wider box try it first with a box liner to ensure a snug fit; remove the box liner if the box is still too tight. On the other hand, your foot should not slide or “sink” into the box. Pain at the longest toe in a shoe that is the correct length may indicate that the box is too wide. If you’re in between boxes try a larger box with a boxliner. Consult the Size Availability Chart if you wish to adjust your box size. Width is measured between the top edge of the box and the side seams. Minimize bagginess and gaping at the sides of the shoe by using the narrowest width that still allows the foot to slide into the box. Consult the Size Availability Chart if you wish to adjust your width. The shank should be stiff enough to help you maintain correct, comfortable placement en pointe, but pliable enough to achieve a high demi-pointe easily. Remember that Gaynor Minden shanks and boxes never weaken. The vamp must be long enough to prevent you from “popping out” of the shoe, but not so long that it hinders demi-pointe. It should cover the toes and big toe joint completely — no visible cleavage! Most dancers wearing Gaynor Minden lengths 8 and longer are better fitted with our deep vamp. Most wearing size 6 and shorter are better fitted with a low vamp. Vamps can be made even longer or shorter by special order. Stand on pointe. If you are “going over too far” or “knuckling” you will need a stiffer shank and/or a deeper vamp. If you cannot “get over enough” or feel “held back” you will need a more pliable shank and/or a lower vamp. Your shank should be as pliable as possible and still provide proper support. Do not fit Gaynor Mindens too stiff. The shoe should fit the entire foot snugly. It should not be baggy or wrinkled at the sides or heels. A small amount of extra material can be eliminated with the addition of a heel gripper. If a heel gripper is not sufficient, consider a low heel, a narrower width, or a Sleek or NEW Sculpted Fit. Note: These models are narrower than our Classic Fit not only at the heel but also in the middle of the shoe; you may need a longer length. 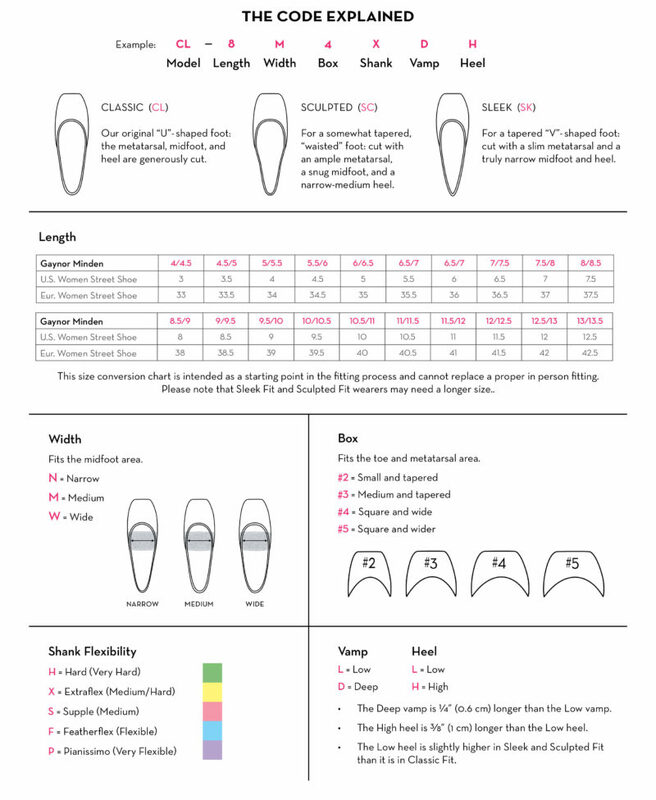 Consult the Size Availability Chart to be sure that the length, box, and width you have chosen are still available if switching to a Sleek or Sculpted Fit. If they are not, call our Fitters Hotline for guidance. 800-637-9240 x12. If the heel feels too low or if it is sliding off, you may need a heel gripper or a higher heel. It is always a good idea to show your shoes to your teacher for approval before sewing ribbons and elastics, remembering to keep them perfectly clean when doing so. Then sew on your ribbons and have a great class! Call our Fitters Hotline, 800-637-9240 x12 if you have any questions. All our “Fitterinas” are highly trained dancers and Certified Gaynor Minden Fitters. With a properly fitted pointe shoe a dancer can perform artistic marvels for hours at a time, day after day, year after year. She can remain comfortable and in possession of feet she’s proud to show off in strappy sandals. A badly fitted pointe shoe, on the other hand, can cause blisters, hammertoes, corns, toenails so bruised that they blacken and fall off, or worse. From annoying distraction to permanent damage — a bad fit can drain the joy from your dancing. But it’s totally avoidable. 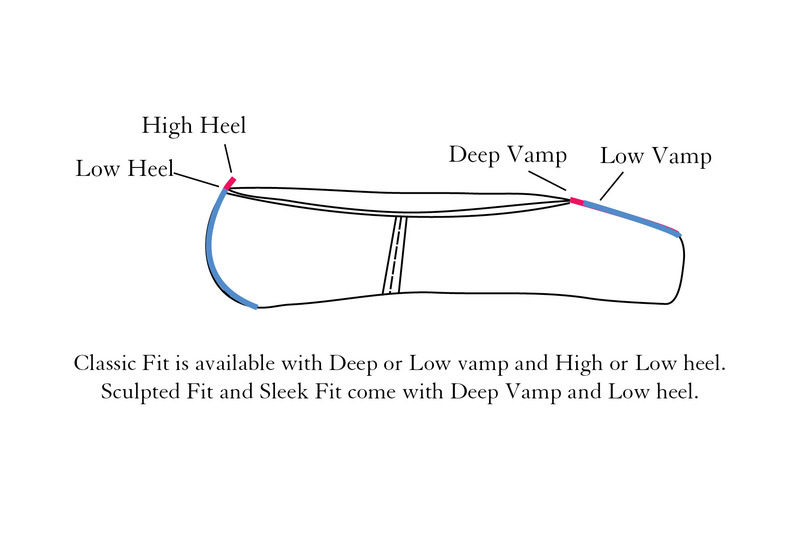 We advise everyone who dances on pointe to take the time to understand how a pointe shoe works, and how it must be fitted in order to work correctly. Click here to see how it’s done! Click here for our Size Availability Chart!